Sealed linear encoders from HEIDENHAIN are protected from dust, chips and splash fluids and are ideal for operation on machine tools. An aluminum housing and elastic sealing lips protect the scale, scanning carriage and guideway from chips, swarf, dirt and splash water The scanning carriage travels in a low-friction guide within the scale unit. It is connected to the external mounting block by a coupling that compensates unavoidable misalignment between the scale and the machine guideways. The aluminium housing of a sealed linear encoder protects the scale, scanning carriage, and its guideway from chips, dust, and fluids. The scale is scanned photoelectrically and as such without mechanical contact or wear. 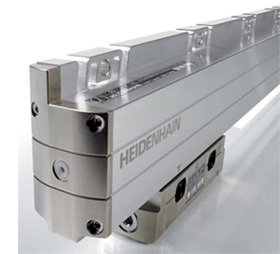 HEIDENHAIN supplies both incremental and absolute linear encoders. Linear encoders with slimline scale housing are designed for limited installation space. Larger measuring lengths and higher acceleration loads are made possible by using mounting spars or clamping elements. Linear encoders with full-size scale housing are characterized by their sturdy construction, high resistance to vibration and large measuring lengths. The scanning carriage is connected with the mounting block over an oblique blade that permits mounting both in upright and reclining positions with the same protection rating.